The Saiban-in system that was established by the Saiban-in Act aims to enable the general public to participate in criminal trials, reflect their sound common sense in judicial judgments, and deepen the general public's understanding of and support for the judicial system, thereby establishing a stronger citizen-oriented basis for the criminal justice system over the long-term. Saiban-in trials involve serious cases that the public has a great interest in, and more concretely cases pertaining to offenses punishable by the death penalty, life imprisonment with or without work (Item-1 cases), or that need to be dealt with at a statutory collegiate court (offenses punishable by the death penalty, or life imprisonment or imprisonment for a minimum term of one year or more with or without work (excluding robbery, etc.)) because they involve offenses resulting in the death of the victim through an intentional criminal act (Item-2 cases), or any consolidated with the above cases. However, certain cases can be excluded if the possibility exists of Saiban-ins or their families, etc. being harmed and they are thus deemed to be unable to perform their duties because of that fear. Cases subject to Saiban-in trials are brought to a pretrial arrangement proceeding prior to the first trial date. The court clarifies the points at issue with the case before determining which and in what order the evidence will be examined. The establishment of a concrete trial plan in this way thus enables the trial to take place in a more intensive and systematic manner (See Subsection 3, Section 2, Chapter 3, Part 2). Fig. 6-2-1 shows the Saiban-in selection procedure. A list of Saiban-in candidates selected by lottery from those listed on the electoral register is made every year by the respective district courts. Saiban-in candidates are then selected by lottery again from the list of Saiban-in candidates to appear in the respective cases, and summoned to the court to take part in the selection procedure. The courts select six (or four in exceptional cases) Saiban-ins by lottery, etc. after excluding anyone considered to have the ground for incompetency for appointment, anyone whose refusal was accepted for having a prescribed reason, and anyone whom the public prosecutor or the defendant, etc. requests not to be selected without having to present the cause in a private procedure. Reasons for refusal include  being 70 or older,  being a local assembly member,  being a student or pupil,  having served as a Saiban-in (or alternate Saiban-in) or a member (or alternate member) of a Committee for Inquest of Prosecution within the last five years,  having appeared at a court on the date of the selection procedure as a Saiban-in candidate within one year prior to that date, and  would have difficulty performing the duty of being a Saiban-in or appearing at the court for some unavoidable reason, etc. To ensure enough Saiban-ins will be present alternate Saiban-ins are selected, if deemed necessary, after taking into consideration the length of the trial and any other relevant circumstances. A daily allowances and travel expenses, etc. are paid to anyone appearing at a court as Saiban-ins or alternate Saiban-ins (hereinafter collectively referred to as “Saiban-ins, etc.” in this section). Saiban-in trials take place over sequential days. Public prosecutors and defense counsels etc. are required to make the effort to make the trials easily understandable in ensuring that the Saiban-ins can fulfill their duties. During deliberations the presiding judges are required to thoroughly explain any relevant laws and ordinances, organize the deliberations, and provide Saiban-ins with the opportunity to make remarks. Deliberations are conducted at Saiban-in trials by a collegiate body consisting of three judges and six Saiban-ins (or one judge and four Saiban-ins in certain cases), and involve identifying the facts pertaining to a judgment of guilty or not guilty, etc., a decision on which laws and ordinances are applicable, and thus the appropriate sentence. Verdicts are rendered based on the opinions of the majority of the collegiate body, including from both the judges and the Saiban-ins (the opinions of both the judges and the Saiban-ins need to be included, and hence a verdict of guilty cannot be rendered even if all the Saiban-ins agree on a guilty verdict if all the judges have opposing opinions). Saiban-ins can question defendants or witnesses, etc. regarding anything necessary in making a judgment if they inform the presiding judge that they wish to do so. Interpretation of laws and ordinances and judgments on criminal proceedings, etc. can only be made by the judges but the results are provided to the Saiban-ins. Saiban-ins are obliged to follow those decisions. In some cases, however, the opinions of the Saiban-ins can prove useful, and hence the judges may allow Saiban-ins to attend such deliberations and air their opinions. 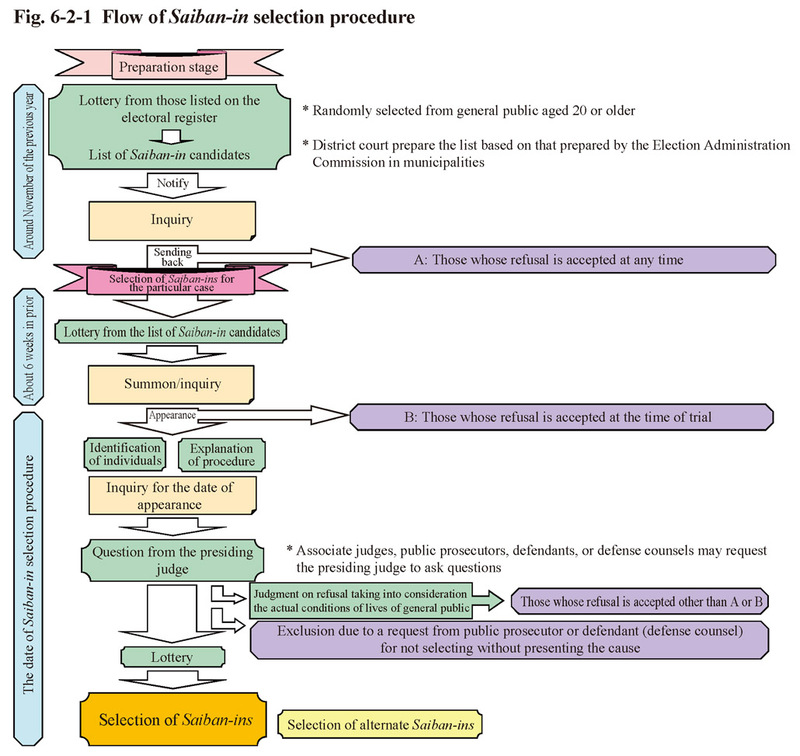 When a trial involves consolidated cases of a defendant, in order to reduce the burden on the Saiban-ins, the cases can be divided into separate parts. 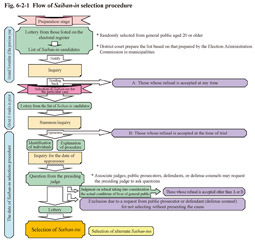 In this case a trial is conducted for each part with different Saiban-ins selected from those who are assigned to the overall cases, and partial judgments then made as to whether the defendant is guilty or not guilty in each part. Saiban-ins assigned to the overall cases then take into account the partial judgments in the course of making their final judgment through deliberation with the judges on deciding the appropriate sentence. Saiban-ins, etc. are obliged to keep any information they have obtained in the course of their duties confidential, including the status of deliberations and the opinions of judges and other Saiban-ins, etc. If the Saiban-ins, etc. do disclose any such information they are subject to punishment, with the same applying after their duties as Saiban-ins have been completed. Measures to protect Saiban-ins, etc. have also been stipulated, including a prohibition on any disadvantageous treatment at workplaces, the non-disclosure of any information that could be used to identify Saiban-ins, etc., and a restriction on contacting Saiban-ins, etc.